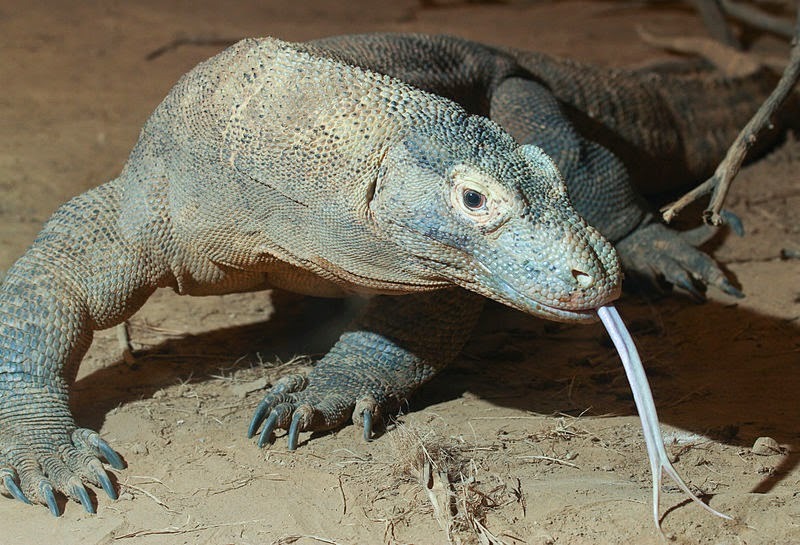 The Komodo dragon holds the record for world's largest extant lizard.. It belongs to the Varanidae family and can be found in the Indonesian islands of Komodo, Rinca, Flores, Gili Motang and Gili Dasami. The species' immense size has long been attributed to island gigantism, since there are no other major carnivorous animals in the area it inhabits. However, recent research suggests the large size may be better understood as representative of a relict population of large varanids that once populated Indonesia and Australia, the majority of which --along with other megafauna-- faded out after the Pleistocene. These terrifying beasts can reach a maximum length of 3 meters (9.8 feet), with the largest ever recorded specimen being 3.13 meters (10.2 ft) long. Their average weight is 70 kg (150 lb) and the tail is almost as long as their body. Males tend to grow a bit larger, however there are no obvious morphological differences between the two sexes. Adults have a dull, uniform color, ranging from brown to grayish red while juveniles are green with yellow and black bands. 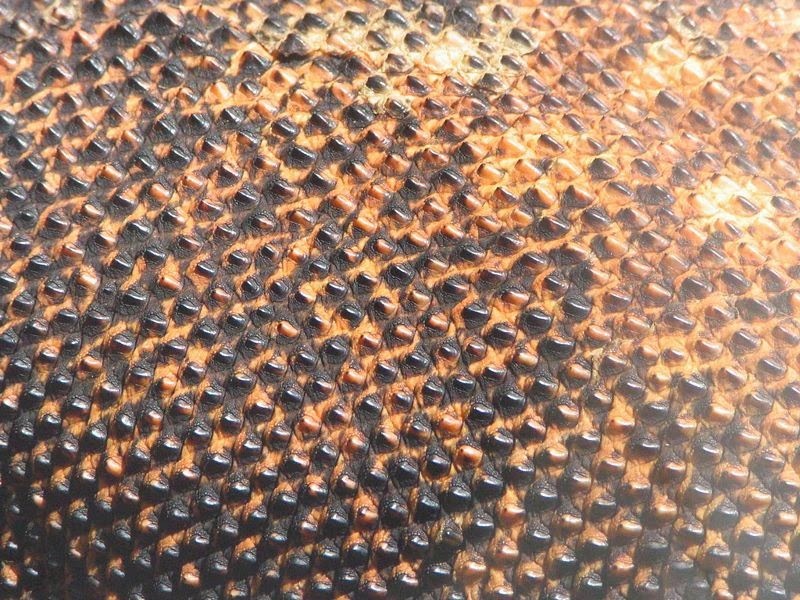 They have robust bodies, covered in rough, non overlapping scales that contain tiny bones called osteoderms. Essentially, the skin functions as a natural chain-mail. The scales also have sensory plaques connected to a series of nerves that facilitate the sense of touch. The ones around the chin, ears, lips, and soles of the feet have three times more the sensory plaques. Komodo dragons have 60 serrated teeth, up to 2.5 cm (~1 in) long. Their saliva is usually blood-tinged. This is due to the fact that the teeth are almost covered by gingival tissue that is naturally lacerated while they feed. The saliva has some intriguing properties that are briefly explored further below (see: Deadly Saliva). Their forked tongue is long and yellow and is used for sampling the air. 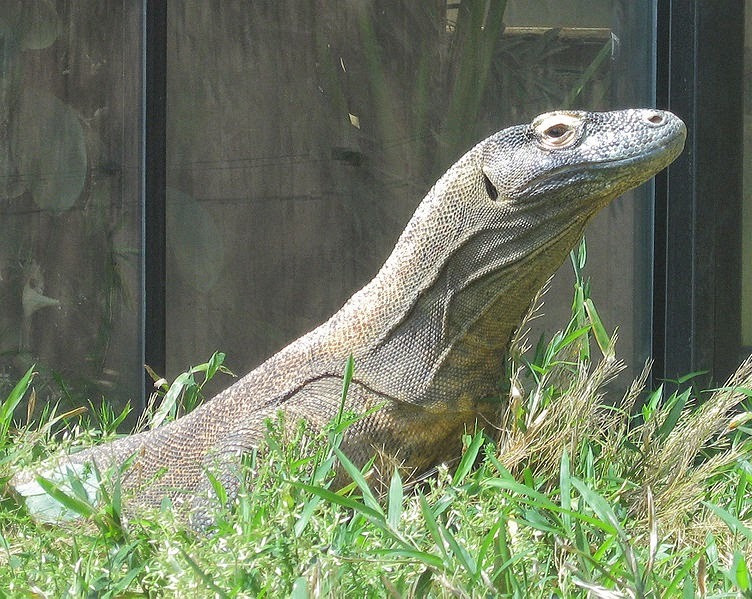 With favorable wind, komodo dragons can detect carcasses from miles away (2.5-5.9 miles/ 4-9.5 km). They have very few taste buds which are located in the back of the throat. In the past, it was believed that komodos are deaf something which later proved to be false. Despite the visible ear-holes, their sense of hearing is very poor, as they can only hear sounds ranging from 400 and 2000 hertz. 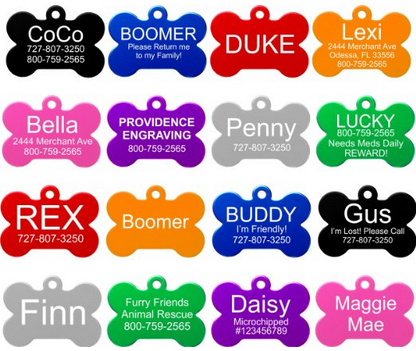 For comparison, humans can hear between the 20 to 20,000 hertz range. Komodo dragon at the National Zoo in Washington, DC. They can see as far as 300 meters (980 feet) away and although they can see in color, they have poor visual discrimination of stationary objects. Their retinas contain only cone cells, which are one of the two main types of photoreceptor cells. Cone cells are responsible for color vision as well as eye color sensitivity and they function best in relatively bright light, unlike rod cells that work better in dim light. 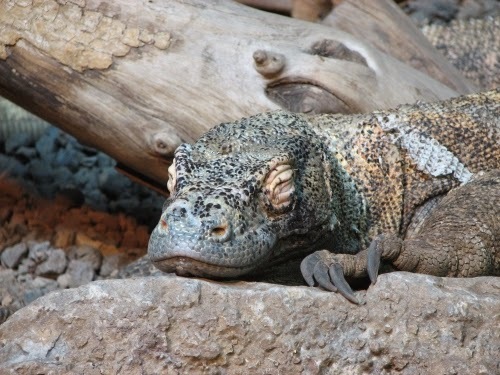 For this reason, Komodo dragons are believed to have very poor night vision. They can run small distances quite quickly, reaching speeds of about 20 km/hour (12 mp/h). Komodo dragons can dive in depths of up to 4.5 meters and young individuals can even climb trees proficiently using their strong claws. However, as they grow they gradually loose this ability and only use the claws as weaponry. According to some sources, they can live to be up to 50 years old. Adults live mainly in tropical savannah forests, proffering open lowland areas with tall grasses and bushes, but are also sighted in other habitats, such as beaches, ridge tops, and dry riverbeds. They are mostly active during daytime (similarly to most exothermic animals), although occasionally they do exhibit some nocturnal activity. They hunt during the afternoon and spend the hottest part of the day in the shade. They are solitary animals, only coming in contact with other Komodos to breed or when they gather around a kill. They dig holes 1 to 3 meters (3–10 feet) deep using their strong and powerful forelimbs and claws. These holes are usually found near ridges with a cool sea breeze and are cleared of any vegetation. They use them as shelter to sleep during the night, as a means of preserving heat. When eating together, larger individuals eat first and then the smaller ones follow. The largest male asserts his dominance and smaller ones show their submission using body language as well as rumbling hisses. 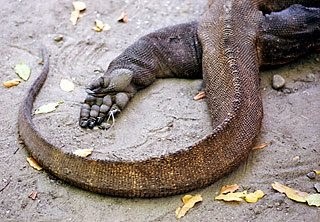 If two Komodo Dragons are of equal size, they may resort to a form of "wrestling". Usually, the losing side retreats, however on some occasions the victor kills and eats the loser. They generally avoid being close to humans. Young komodo dragons are particularly shy, immediately fleeing when a human comes near a distance of 100 meters (330 ft) or closer. Adults tend to also run away, but in closer distances. When an individual is cornered, it will gap its mouth, hiss and swing its tail. Further cornering may result in the animal attacking with any possible means, including biting and scratching. Unprovoked attacks to humans are very rare, with most recorded cases being from non-reputable sources. They are carnivorous animals, mainly consuming dead animals. Sometimes, they also hunt live prey and when they do, they try to remain as stealthy as possible. Adults are known to ambush deer, water buffalo and wild pigs. They stay motionless and when they are given a chance they charge at full speed aiming for the throat. They locate their prey using their keen sense of smell. Komodo dragons can also catch prey which is out of their immediate reach, by standing on their hind legs, using the tail as support. 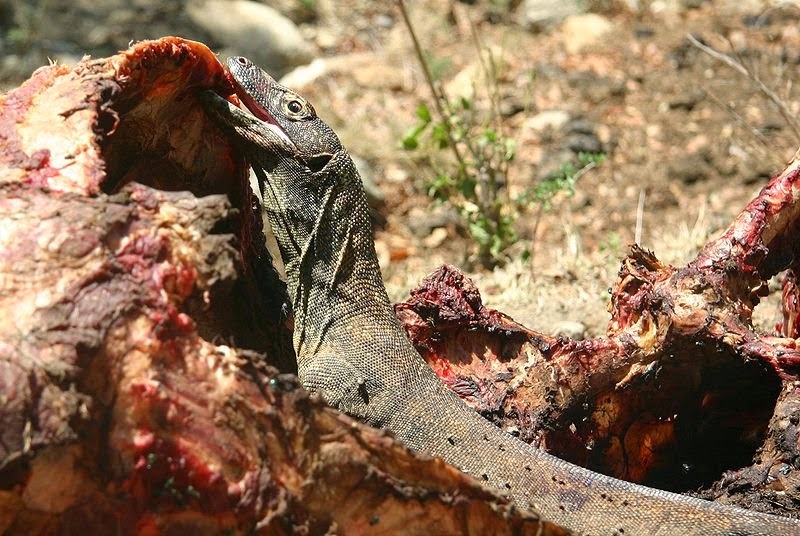 When eating, Komodo dragons don’t chew their prey. They either swallow it as whole - if it is small enough like a goat - or cut large chunks of flesh out of it. Although their saliva acts as a lubricant, it still takes a long time to completely swallow their meal. For instance, it takes them about 20 minutes to swallow a goat. When swallowing, they breath using a small tube located under the tongue. They can eat up to 80 % of their body weight per meal and survive on as little as 12 meals a year. After digestion has been completed, they regurgitate a mass of horns, hair, and teeth that is covered in malodorous mucus. This mass is called "gastric pellet". After regurgitating, they rub their face in the dirt or on bushes to get rid of the mucus. 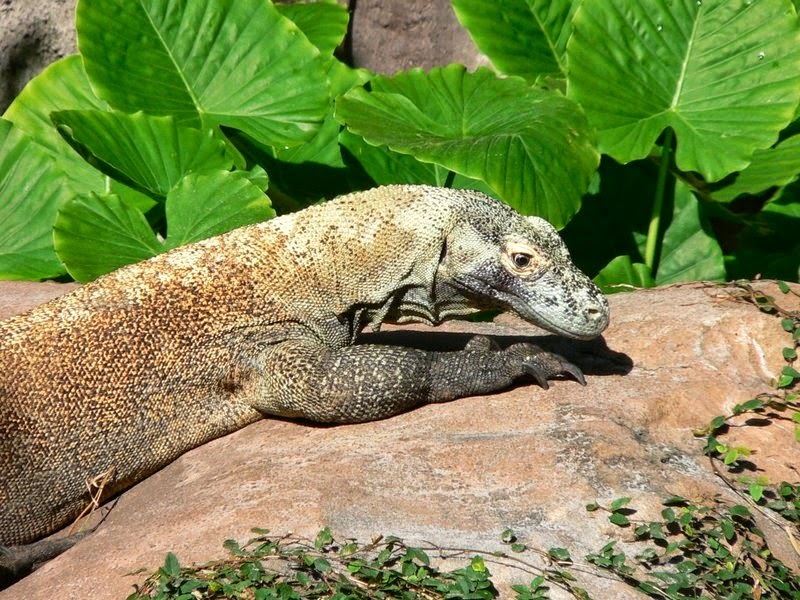 This suggests that, like humans and other animals, komodo dragons don't relish the scent of their excretions. Komodo dragons, if given the chance, will eat human corpses. They are known for digging up bodies from shallow graves. They drink by sucking water into their mouth via buccal pumping, first lifting their head and then letting the water run down the throat. An interesting fact is that many times they don't manage to instantly kill their prey when hunting. They follow the prey and eat it a few hours or days later, when it can no longer flee and defend itself. The wound doesn''t have to be serious to prove lethal, as their saliva is full of deadly bacteria that cause sepsis, swelling, excruciating pain and eventually death. Recent research indicates that their bite is also venomous, with complex venom glands in its jaw. Unlike snakes which use an injection-like method, the venom is administered rather crudely, seeping into the large wounds made by their teeth. They mate from May to August, laying their eggs in September. During this period, males fight over females. They wrestle one another in an upright position using their hind legs, with the loser eventually being pinned to the ground. The winner then flicks his tongue to the female, to gain info about her receptivity. He then proceeds by rubbing his chin on her and licking her body. But the struggle for males still continues, since females resist hard with their claws and teeth during the early courtship phases. The male has to fully restrain her during coitus otherwise she will most probably hurt him. They may be monogamous, a very rare behavior among all lizard species. Female Komodos lay their eggs in burrows cut into hill sides. Sometimes, they also use the abandoned nests of the Orange-footed Scrubfowl (Megapodius reinwardt). On average, each clutch contain 20 eggs. Incubation lasts 7 to 8 months. Hatchlings have a hard time getting out of the eggs. They use an egg "tooth" (which falls a little later) to break the eggshell. Getting out of the egg is very tiring and many of them lie for hours in the ground before digging out to the surface. But their fight for life has just begun. There are many predators, including cannibalistic individuals of the same species. They have no way to defend themselves and thus spend most of their first year on trees where it's safe from cannibalistic adults and other carnivorous species. After about 8 months, they gradually begin to become solely terrestrial. Hatchlings are about 37 centimeters (~14,5 in.) long and have a very high mortality rate. An interesting fact is that younglings commonly cover themselves in feces and rest in the intestines of eviscerated animals. This strange behavior is most probably used to deter larger, cannibalistic komodo dragons from eating them. It takes them 5 to 9 years to fully mature. The species is able to reproduce via parthenogenesis. This was first reported by officials at London Zoo, when one of their females (named Sungai) laid a clutch of eggs in late 2005. The last contact Sungai had with a male was two years before. At first, researchers thought that she was able to store sperm from an old encounter with a male. 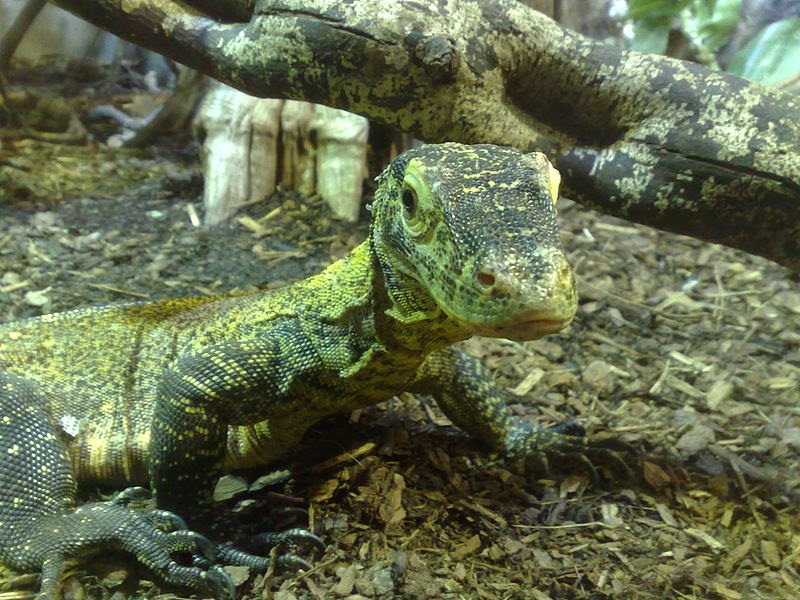 On 20 December 2006, another female in the Chester Zoo in England (named Flora) laid 11 eggs. Seven of them hatched and all were males. Genetic testing by researchers at the Liverpool University revealed that in both cases, the eggs were produced parthenogenetically without outside fertilization. Hatchlings produced via parthenogenesis are always males. It is believed that this reproductive adaptation allows a single female to enter a new ecological niche with no other individuals of the same species (such as an island) and using parthenogenesis to "conquer" it producing male offsprings, thus establishing a sexually healthy population which can produce both male and female youngs. Please note that the above numbers are approximate and may be outdated. There was also a population on the island Padar, which has most probably gone extinct as no individual has been seen since 1975. It is believed that the population dissipated after a strong decline of their prey, for which poaching is most likely to be blamed. According to a study, there may be only 350 surviving females left which raises concerns regarding the species survival. Komodo dragons in captivity usually tame down quite quickly and even learn to recognize their keepers, following them around the enclosure, "begging" to be fed. They have been observed to play with a variety of objects, including shovels, cans, plastic rings, and shoes. This particular behavior does not seem to be food or predatory motivated..
Due to being relatively docile and able to familiarize with their keepers, many believe that if it wasn't for their large size and other special requirements they would be ideal reptilian pets. There are over 30 zoos all over the world having at least one for display. Thanks to their immense size, they are one of the most popular attractions. - As aforementioned, the swallowing process takes a lot of time. There have been reports of Komodo Dragons ramming over trees (and other objects) while holding food on their mouth to speed up the process of swallowing, by forcing the food down their throat! The impacts can be so strong that the tree may be knocked down! - Many times, males vomit or defecate before the courtship fights. - In June 2001, a Komodo dragon at the Los Angeles Zoo seriously injured Phil Bronstein, the then husband of Sharon Stone. He entered its enclosure after being invited in by its keeper. Just before, Bronstein was asked by the keeper to remove his white shoes and socks, as they shared the same color as the white rats the zoo personnel fed the animal. The komodo dragon bitten his bare foot. Bronstein survived the attack, however he needed to have several of his foot tendons surgically reattached. - The pathogens in captive animals disappear overtime due to cleaner diets and the use of antibiotics. - Some of the septic pathogens found in their saliva are E. coli, Staphylococcus sp., Providencia sp., Proteus morgani, and P. mirabilis. - Why they are not affected by the virulent bacteria found in their saliva still remains a mystery. - Locals call them ora, meaning "land crocodile". 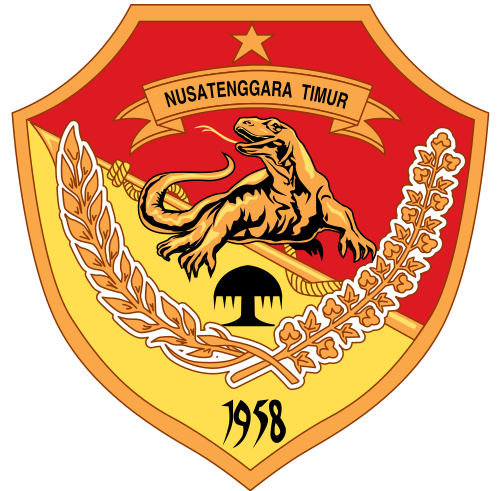 - The species is featured in the emblem of East Nusa Tenggara province, a province of Indonesia. AKU TELAH MELIHATI NAGA-NAGA KOMODO DALAM LIAR DI PULAU KOMODO PADA TANGGAL 13.8.1997. IN 13/8/1997 I SAW KOMODO DRANGONS IN THE WILD ON THE ISLAND OF KOMODO. Me jelly of ya !